On Jan. 20, Jeremy Leonard visited the Parker School campus to share his career journey with the 11th and 12th grade classes as part of Parker School’s Speaker Series. The series, started by Rea Callender, in September of 2005, has served as an excellent professional development opportunity for Parker students; bringing many well known artists, scientists, businessman and entrepreneurs to the school’s stage to share their stories of success, determination, dedication and the importance of following one’s dream. 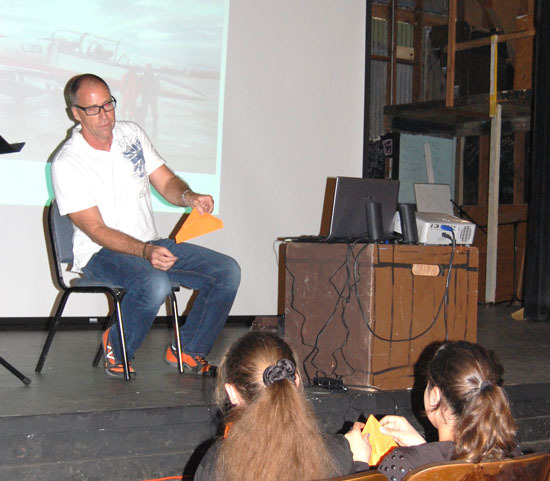 Leonard’s presentation started out with footage of him flying a fighter plane and captivated the audience’s attention with his stories of the various twists and turns of his career. Leonard is the founder of Investologist Corporation, Pacific Pump and Power Corporation, Canada Pump and Power Corporation. He also is the founder of Work For All, a charity focused on alleviating systemic poverty by connecting businesses around the world. He lives on the Big Island with his wife Carol, and two children.